One of my travel guides calls the San Simpliciano a “little jewel”. That is a bit of an exaggeration, but the church is worth a visit nonetheless. 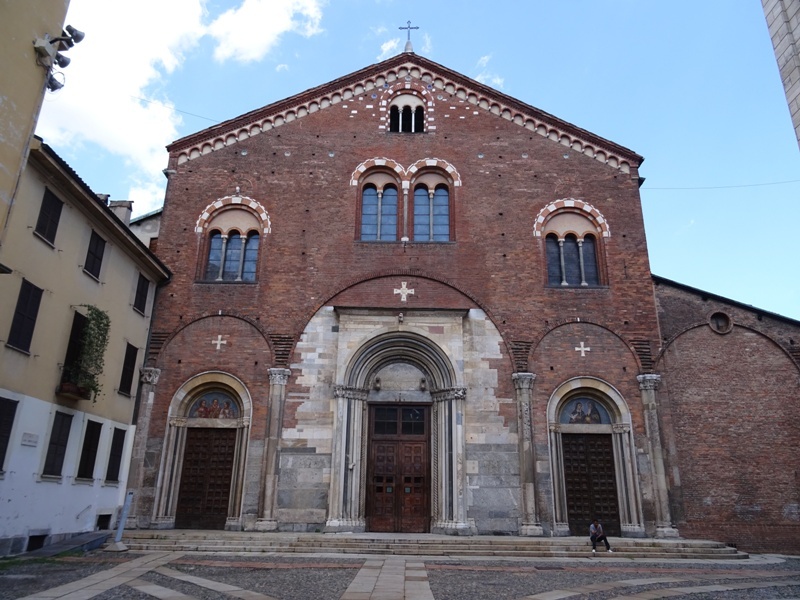 It is one of the three or four churches in Milan founded by Saint Ambrosius (ca. 340-397). 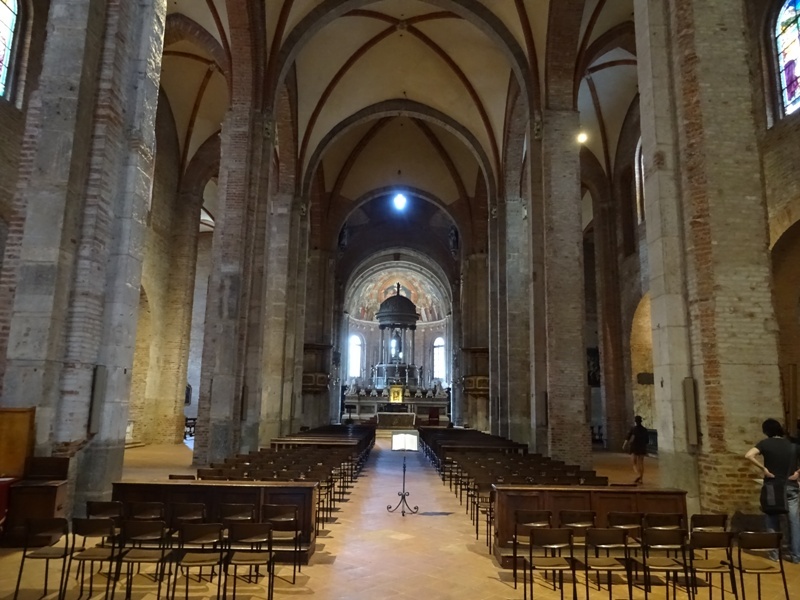 The church was completed in 401 and originally called the Basilica Virginum, the Basilica of the Virgins. Later it was renamed the San Simpliciano, in honour of Ambrosius’ successor as bishop of Milan, Simplicianus. The other churches attributed to Ambrosius are the Sant’Ambrogio, the San Nazaro in Brolo and the now demolished San Dionigi. The facade of the San Simpliciano is somewhat peculiar. It is mostly the design of Carlo Maciachini (1818-1899), who is best known for designing Milan’s Monumental Cemetery further to the north. Maciachini added the facade in 1870, but for some reason decided to keep the original main entrance, which was not built in brick. Decorations of the main portal. The decision not to demolish this part of the older facade has also led to the preservation of some of the medieval decorations. On either side of the entrance are sculptures of two processions of women carrying lamps, perhaps a reference to the Parable of the Wise and Foolish Virgins in Matthew 25:1-13 (see Rome: Santa Maria in Trastevere). The mosaics on the facade were added as part of Maciachini’s 1870 restoration. 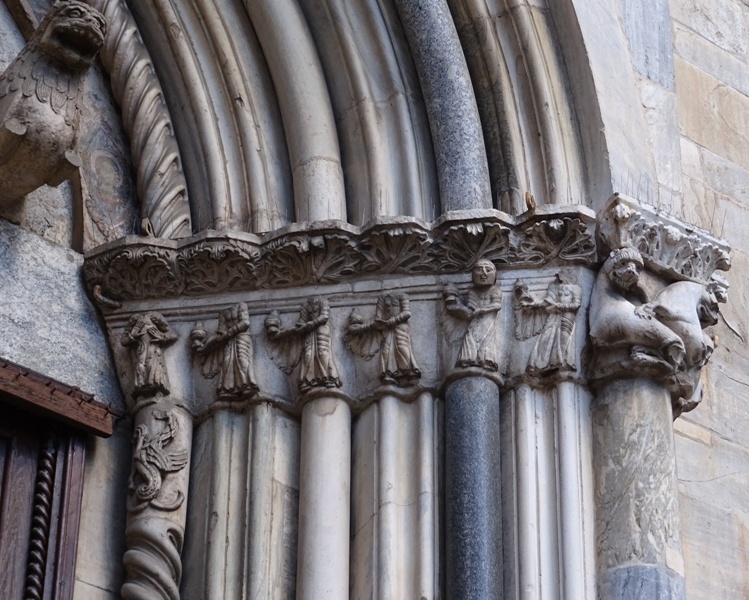 The one above the right entrance shows the Saints Scholastica and Benedictus of Nursia, the one above the left entrance the Saints Sisinius, Martyrius and Alexander. Note that the labels with their names are actually in Italian, not Latin. Sisinius, Martyrius and Alexander were, according to tradition, Christians from Cappadocia who accompanied Saint Vigilius of Trent on his missions. Around the year 397, they were killed by pagans as they tried to convert the local population to Christianity. Their remains were brought to Milan, where bishop Simplicianus had them interred in the Basilica Virginum. The bishop’s own relics are also kept in the church. There is a legend that Sisinius, Martyrius and Alexander helped the Lombard League to defeat the forces of Frederick Barbarossa, Holy Roman emperor, at Legnano in 1176. Before or during the battle, three doves flew from the church to the field at Legnano and landed on the carroccio, the war wagon of the League. This was seen as a sign of the imminent Lombard victory, and indeed the League was victorious. The emperor barely escaped with his life. The interior of the San Simpliciano is simple and unspectacular. There is little decoration. Although it was very dark inside the church, there was fortunately just enough light to admire the frescoes by Aurelio Luini (ca. 1530-1593) painted on the lower parts of the two pipe organs near the high altar. His angels playing all sorts of musical instruments are really charming. 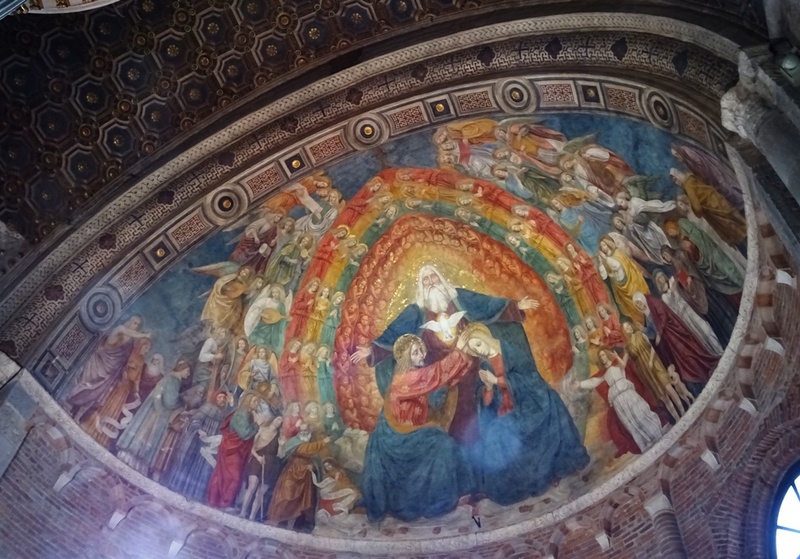 However, the highlight of the church is a large fresco in the apse by Ambrogio Bergognone (died ca. 1524). His Coronation of the Virgin was executed in 1508 (or a little earlier) and is an artistic masterpiece. The fresco is very colourful and it seemed to be in excellent condition when I visited the church in August 2016. For this post I made use of the Dorling Kindersley travel guide to Milan and the Lakes (2010). Italian Wikipedia has a good article about the church, with more pictures.